Graphene Technology to Deice Aircraft. Signet International Holdings, Inc.’s (OTC: SIGN) subsidiary, SGT, has executed a contract with Florida International University (FIU) to further the development and commercialization of a new deicing technology enhanced by graphene, the revolutionary carbon-based nanotechnology. The graphene foam−polymer composite has superior deicing efficiency and strength and is expected to have a major impact on the aircraft deicing market. Palm Beach, FL, January 17, 2019 –(PR.com)– Mr. Tom Donaldson, President, Signet International Holdings, Inc. (OTC: SIGN), the parent company of Signet Graphene Technologies, Inc. (SGT), announced today that the company has executed a contract with Florida International University (FIU) to further the development and commercialization of a new deicing technology enhanced by graphene, the revolutionary carbon-based nanotechnology. 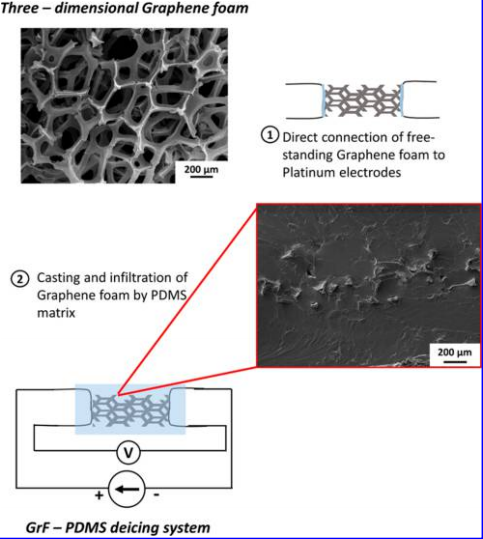 A team of engineers at Florida International University headed up by Professor Arvind Agarwal, Ph.D., Chair of Mechanical and Materials Engineering and his team in Plasma Forming Laboratory: Ms. Jenniffer Bustillos, Dr. Cheng Zhang, and Dr. Benjamin Boesl have developed a graphene foam−polymer composite with superior deicing efficiency and strength. A patent for the technology will be issued on Jan. 22, 2019.